To strengthen interaction with end users we conducted a survey of the needs of the chemistry climate community. The survey collected answers for different questions from a representative sample of modelling groups and end-users that exploit general circulation models for climate research. Survey data collection was conducted during June and July 2013. An online questionnaire was created using the GNU software LimeSurvey and uploaded on a server of the Physics Department of the Aristotle University of Thessaloniki. The questionnaire was designed concisely following the good-practice recommendations of Kelley et al. (2003). Invitations (~80) to participate to the survey were sent to modelling groups and individual end-users of the climate modelling community and data collected are representative of the different model families (e.g. Chemistry-Climate Models, Earth System Models, Atmosphere-Ocean General Circulation Models,) commonly used in climate research. As expected though for this type of survey method and the fact that many recipients were belonging to the same modelling group, the response rate did not exceeded 20%. A list of the climate models participated in this survey is given in Table 1. 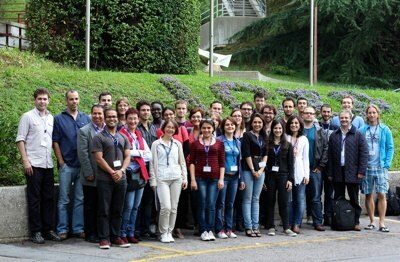 34 students from 18 countries attended the summer school on Solar variability and climate response, organized jointly by SOLID and COST Action TOSCA at the Abdus Salam International Centre for Theoretical Physics in Trieste, 13-17 October, 2014. This one-week training course focused the global understanding of the complex and controversial role of solar variability in climate change. Various topics were covered, including the basic processes (solar, heliospheric, and atmospheric physics) with emphasis on the climate response, diagnostic techniques, errors and uncertainties, needed research, and socio-economic aspects. c) to establish collaboration on required recommendations for future modeling activities, in particular CMIP6. The workshop provided a great opportunity to climate modeling and solar communities to discuss the current understanding on solar cycle variability and its impacts on climate. Among other issues, much of the discussion was dedicated on requirements for forthcoming model intercomparisions in regards to spectral (SSI) and total (TSI) solar irradiance products. To this direction a number of comparison studies were organized and undertaken as described in WP6 achievements.